Is the flea market a helpful analogy for understanding the social world (“The Dis-unity of Science”)? Does it serve to provide a different mental model in terms of which to consider the nature of social phenomena? What it has going for it is heterogeneity and contingency, and an obvious share of agent-dependency. The people who show up on a given Saturday are a contingent and largely disorganized mix of humanity. And the products that wind up on the jumble tables too are highly disorderly and random. Each has its own unique story for how it got there. There is no overall guiding design. But there is also a degree of order underlying the apparent chaos of the jumble tables. All is not random in a flea market. The participants, for example: there are regular vendors, street people, police officers, health inspectors, jugglers, and pickpockets — as well as regular shoppers, tourists, school children, and occasional shoppers looking for a used toaster or a single kitchen chair. In most cases there are reasons they are there — and the reasons are socially interesting. 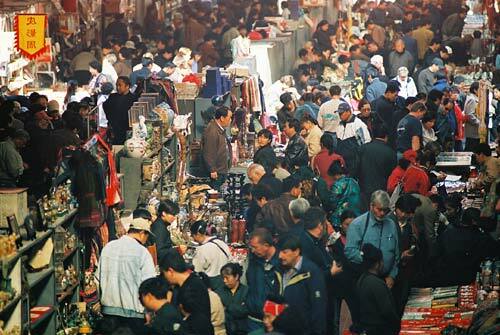 Moreover, the ethnographer of the flea market is likely enough to spot some seasonal or social patterns in the products and people present in a certain month or time of year. So — a blend of chaos and order. But the order that can be discerned is the result of a large number of overlapping, independent conditions and processes — not the manifestation of a few simple forces or a guiding system of laws. Both accident and order are characteristic of the larger social world as well. The helter-skelter of the flea market is in fact highly analogous to many aspects of social phenomena — army recruitment, incidents of crime, mortgage defaults. But it is also true that there are other social phenomena that aren’t so accidental. So the jumble sale is perhaps less good as an analogy for highly organized and managed social processes — a tight administrative hierarchy, an orchestrated campaign event, or a coordinated attack in battle. This addresses the “accidental conjunction” part of the analogy. What about the “composite order” part of the analogy? This element too works pretty well for many examples of social phenomena. When students of the professions discover that there are interesting patterns of recruitment into accountancy or the officer corps, or discover that there are similarities in the organizations of pharmacists and psychotherapists — they also recognize that these patterns result from complex, intertwined patterns of strategic positioning, organizational learning, and economic circumstances. In other words, the patterns and regularities are themselves the result of multiple social mechanisms, motives, and processes. And these processes are in no way analogous to laws of nature. So, all considered, the analogy of the flea market works pretty well as a mental model for what we should expect of social phenomena: a degree of accident and conjunction, a degree of emerging pattern and order that results from many independent but converging social processes, and an inescapable dimension of agent-dependency that refutes any hope of discovering an underlying, law-governed system.